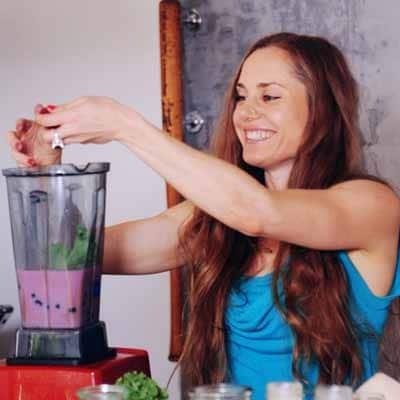 Rowena Jayne is a Leading International Yoga Instructor, Raw Food Chef and Wellness Presenter. She is a qualified Naturopath and Nutritionist and has studied Ayurvedic Medicine. Jayne has been a yoga instructor for 10 years and has helped with international Yoga Teacher Training. She is a two time Australian Yoga Asana Champion (2007 & 2010.) Jayne has contributed to the transformation of thousands of lives across the globe through her classes, workshops, retreats and published articles. She has lived in India and Singapore and currently resides in Australia. Caryn Hartglass: Hey everybody. I’m Caryn Hartglass and you’re listening to It’s All About Food. Thank you so much for joining me and I hope you are cool wherever you are. It’s a little warm here in humid New York but as I mentioned earlier, I am happy to be home since I’ve been away for about a month and just been home for a week now and still taking some time to get used to. But I’m happy to be here. Now I want to introduce a very special guest, Rowena Jayne. She’s a leading international yoga instructor, raw food chef and wellness presenter. She is a qualified naturopath and nutritionist and has studied Ayurvedic medicine. Jayne has been a yoga instructor for 10 years and has helped with international yoga teacher training. She is a two time Australia Yoga Asana Champion, 2007 and 2010. She has contributed to the transformation of thousands of lives across the globe through her classes, workshops, retreats and published articles. She has lived in India and Singapore and currently resides in Australia. I can’t believe we’re finally connecting! Rowena, how are you? Rowena Jayne: Hi, good, how are you? I know, the third time lucky. Caryn Hartglass: Yes, the third time’s a charm so people may or may not remember but I had Rowena scheduled twice already and due to difficulties far beyond our personal control, we had to cancel. It was a close call today but we made it. Rowena Jayne: We made it. Caryn Hartglass: Thanks to technology. So, how are you? Rowena Jayne: I’m great, how are you? I heard you saying that it’s nice and humid in New York. It’s the exact opposite here, it’s cold. When you said warm and humid I was a little bit jealous. Caryn Hartglass: Well I mean that’s what I love about being able to connect via the internet. It makes our planet really, really small. Rowena Jayne: Yes it does, doesn’t it? Caryn Hartglass: So is it winter time down under? Rowena Jayne: It sure is. Just smack bang in the middle. It’s a cold snap at the moment. Caryn Hartglass: So I’m going to talk about all kinds of foods for hot weather and you’re going to tell me what’s going to keep us cozy in the winter time. Caryn Hartglass: But that’s okay. Now, my first question is you have this lovely book out, Real Food Yogi. Actually, I want to say that one of the things I like about it, it’s called the joy of real food. My non-profit is called Responsible Eating and Living and the acronym is R-E-A-L. That’s intentional because it’s about eating real food, not processed food and it is all about joy. I love the title and love what it’s all about. Thank you for that. It’s a lovely little book. So we’re going to be talking about that and I’m going to pull up all these notes that I made when I read this several months ago when we were first going to talk. So let’s get a little history about you because you had some health issues and a lot of pain. Rowena Jayne: I did. A lot of pain; emotionally, physically and mentally. Caryn Hartglass: Yes, physical and mental. And they’re connected. Rowena Jayne: Well of course everything is connected, body and mind. So I was in the performing arts industry actually and life was going along pretty well I thought and then I guess I started struggling with an eating disorder. That really went on for 10 years and so I was starving and binging, starving and binging. When I binged it was bread, it was sugar and it was lollies and it was everything that was going to cause inflammation. Ill health in the body and I had constipation for a year, I had splitting nails, my hair was breaking and I was getting sick all the time. Then I woke up one day and I had rheumatoid arthritis which is an autoimmune disease. My left knee was swollen to the size of a football and I couldn’t walk. So that took away my whole life really. I mean I couldn’t dance, I couldn’t sing and I couldn’t act. So it was a stepping stone to starting to wake me up, I guess, and start to look after myself. I tried to detox and what not but I still was mentally ill, really, because I had an eating disorder. Until I sort of fixed that sort of mental stuff and then I end up with a bleeding colon. That was the real wakeup call. I ended up in hospital and they said we think you have Crohn’s disease. So I pretty much from that moment on I realized that I had to change my life. I went about doing that and found yoga. Yoga was the thing that helped my mind set. It just put me into this space of feeling really grand and really calm and happy and joyful and I had so much energy. It just made me want to eat well. For the first class I remember all I wanted to eat was pumpkin and so I completely shifted from junk food and sugar and packets of bread to wanting to eat vegetables. So that just started this whole new spiral of my life. I just started studying more and more, and learning more and more about the body and learning more and more about nutrition and healthy food. I started studying Ayurvedic medicine and nutrition and became a raw food chef and it’s just gone from there. Caryn Hartglass: And listen to her. Listen to the energy and listen to the joy. I love stories like yours. For a lot of people, they may not have gotten as bad as some of what you tell us about what you experience. But a lot of people are not feeling good, not feeling healthy and experiencing discomfort in one way or another. That click, that change, it’s so difficult for a lot of people and it’s hard for us to even remember those who have made it to the other side. How we felt before and what was it that made it click for us? Rowena Jayne: I think for me, I just remember, I really remember the pain that I was in when I was in the hospital with a bleeding colon. I remember lying in there because I had a whole night before the actual doctors came and spoke to me. I just remember and I couldn’t really sleep because I was just in agony. It was just this desperation of I just can’t do this anymore, just can’t do this to myself anymore. And then when they said to me you have Crohn’s disease, it was just this – it was like I just blocked everything else they said out, it was just this – I can’t do this anymore. I can’t do this. Is this going to be my life I have to turn it around? It was like this snap for me. It wasn’t like I hadn’t tried to heal myself in that whole 10 years. I’ve been desperately trying to heal myself but I don’t know, something just snapped inside of me. I don’t know whether it was a spirit talking to me because it was almost like I heard this voice say no, this is your wakeup call. It really was just a snap thing, my mind said, no, you can’t do it anymore and decision I think once I make a decision in my life, that’s it for me. A real decision, I think it was that real commitment to myself that I made in that moment. I think when you’ve really made a true, honest, authentic commitment, you’re just going to change. That’s how it happened to me. Everybody’s probably different. Caryn Hartglass: I like to tell people that they deserve to treat themselves well. Caryn Hartglass: And a lot of people don’t feel like they deserve to be good to themselves but I want to tell everyone out there that you deserve to treat yourself well and that means taking care of your body and feeding yourself well. You mentioned a number of things; you don’t know what it was, a spirit guiding you or whatever. I think – I don’t know the answers but I like to think that we come with all the answers inside of us. Caryn Hartglass: Our body knows. We just need to find a way to talk to our bodies. And then I also like to think, again, I don’t know what I believe. I’m not a religious person, I am a spiritual person. I like to think there are guides out there. I don’t know what that means but I see things or I hear things, intuition and you follow them and it leads you to a good place. It’s all about yoga probably encourages that. Getting quiet, being mindful and paying attention. Rowena Jayne: Exactly. It’s funny you touched on it. I wrote in my book that it’s our birth right. I really believe it’s our birth right to be happy. It’s our birth right to be healthy. It’s just that matter of tapping into that and I think that’s how yoga helped me the most really. Just to keep it going once I made that decision because it does, it puts you into that space. You create a whole new relationship with your body too I think. When you start looking at your body as a temple, we’ve chosen to live in our body, it’s so easy for us to come home and want a nice clean house and yet our own bodies, we’re living in our body. Our soul is living in our body and we treat it like a garbage truck sometimes and we just shove all kinds of stuff into it. I think it’s just that awareness and that awaking of wanting to respect the void that’s helping us to live our life. It’s really the case that we’re using to experience life in all the various forms that we do while we’re in this lifetime I guess. Caryn Hartglass: And you’re right, it is amazing how much crap our body’s can manage. Rowena Jayne: I know. It really is resilient, that poor liver. I’m sorry. Caryn Hartglass: It is. We really need to be nicer to our livers. I think we should start a new campaign: “Be nice to your liver and you will live nicer.” I’m on to that, I like it. Okay, yoga is – I don’t like when I read an article saying how trendy yoga is. It’s not trendy; it’s been around for so long. Rowena Jayne: I know, I hear you. It’s just become this fad. I mean look, it’s great, people are doing it but yes it has become sort of a fad, hasn’t it? You know, pop culture. Caryn Hartglass: But once you learn how to do it and I don’t know – how did you learn yoga? Rowena Jayne: Well I actually had studied a little bit of it during my performance art degree but I didn’t really enjoy it to be honest at the time. I didn’t really appreciate its value. After I got out of the hospital, I literally bumped into a yoga study, well accidentally, literally or whatever you want to call it, synchronously. So that’s how it started for me. I just ended up at this yoga studio and it was very much yoga therapy. I just kept going from there and just studying all kinds of various forms and what not. Caryn Hartglass: I want to say that yoga is wonderful but just like anything in any other field, there are good yoga instructors and there are some that aren’t that good or some don’t get it. Caryn Hartglass: I want to make people aware that if you find yourself in a class where it didn’t feel right and it didn’t feel good and you were being pushed or manipulated, you weren’t in the right class. I encourage you to find another. I learned from videotapes back in the day. We used videotapes and now they are DVDs. But I found what I like about it, I’m pretty disciplined, but what I like is I can go at my own pace, I can repeat what I didn’t understand and nobody was really bothering me. It was my own personal practice because that’s what yoga really is, your own personal practice. Rowena Jayne: Yes, when you’re practicing in a class, it basically leads you to that position of personal practice and some people just prefer to keep going to class. I’m the same; I’ve really progressed to that point. I do love to go to class but it’s more about the community for me but I love to do my own practice now as well and just listen to what my body is telling me it needs on each given day. But you know in the early days, it’s obviously better to have an instructor so they can check your technique and obviously going down that path. But it’s funny because it does eventually lead you to that point of being able to do your own practice. Rowena Jayne: Yes. We do live in a world where we are just so busy. We’ve got responsibility after responsibility on our shoulders and so I think in this day and age, we really do just have to plan and just make that. I know you see people when they go to the market, they haven’t even planned a shopping list, they’ll just buy all kinds of stuff and they’ll always spend more money. This is when I’m talking to clients and their budget always goes out and where if they even just planned there list of what they’re going to make for the week, it completely helps their budget and all kinds of things. It’s amazing how just that small thing can make such a difference and it just helps them commit to what they’re wanting to do, really. It’s all down on paper too. David Wolfe spoke about this when he came to Australia and he was saying that anything that’s just in your head is never as powerful as if you’ve just written it down. It’s that whole planning. You’ve written it down and you’re accountable for it. It’s quite interesting, isn’t it? I think we’re all sort of preaching this saying. I don’t want to use the word preaching I guess but we’re all just sort of spreading the same in different words. Caryn Hartglass: Yes, unfortunately we do look like religious zealots when we’re preaching the power of plants. Okay the last thing I want to bring up before we talk about your book and the recipes in it is I want to talk about hemp seeds. Now I didn’t know this but you wrote that hemp seeds are illegal for human consumption in Australia. Rowena Jayne: I know. Can you believe that? Caryn Hartglass: What is that! Rowena Jayne: They are legal in every other country in the world except for Australia. When I first came back, because in as living in America and Canada so I was used to having them all the time and then I came back to Australia to the health food shop to buy some and they said no, we can’t have them here. I said what? They said we’re allowed to have hemp protein which is the grain protein and so it’s very gritty if you put it in smoothies so this is not the same. And then finally we’ve now got – it’s funny because they actually produce it in Australia, they can farm it here. They do have it in health food shops now but there is a massive sticker on the label and it says for pet consumption only. I think that the government believe that it’s promoting cannabis, you know? Not quite the same thing really. We’re madly trying to change that over here. Caryn Hartglass: So have you eaten hemp seeds in Australia? Or shouldn’t I ask you that question. Rowena Jayne: I am not going to say, I can get arrested if I say yes. Well I do have packets of them in my house and I don’t have a pet, that’s all I’m going to say. Caryn Hartglass: When I read that, that was crazy. I remember hearing from someone else from Australia who told me that all of the sugar in Australia is vegan where as here in the United States, we filter a lot of sugar with charred animal bones. Rowena Jayne: Oh really? I didn’t know that. Caryn Hartglass: Yes, fascinating what we do to make a buck. Okay, so you put together a lovely, joyful little cook book. Caryn Hartglass: Yes, so do you eat entirely all raw? Rowena Jayne: I’m about 80%. I mean in winter sometimes it goes to 70% but I do it predominately raw. These days, I have so much more juices and salads. I think the more you go down that clean living path the less you want to eat the heavy stuff. Some of the stuff in my book was stuff that I used to eat long time back but I might eat it once in awhile now but it’s not part of my daily routine so much anymore. I just find I eat more clean and much lighter foods. Especially I think the yoga contributes to that as well but I’m not entirely raw, no. Caryn Hartglass: Okay now I was curious because you applied the concept of Ayurveda to your food and I’m familiar with Ayurveda but it’s not something that I subscribe to. I know that raw food really doesn’t jive with Ayurveda and vegan foods so how do you make that work? Rowena Jayne: Well that’s how I made it work because as I said in the book when I first studied Ayurveda, my teacher was very anti – I think the raw food, the reason they say it doesn’t gel with Ayurveda or we think it doesn’t gel is because the fact that raw food is cold and damp and all the things. For a person of Ayurveda constitution who is a very light, typically, Ayurveda constitution is very light framed. They are going to have digestion issues, bloating always for them. They are going to have feelings of fear and anxiety so the Ayurveda believes that a lot of raw food will actually aggravate that condition. But if you look at the principles behind it, they need more oily foods and they need more nourishing warm foods and so if you are looking at the principles of raw, we don’t always dehydrate our food to the point to just sipping Crispin and light crackers and things like that. You can still just dehydrate, use the dehydrator as an oven and just keep making food nourishing and warm without actually having to cook it all the way, the way we cook it with ovens and all that. Normally, it just takes the enzymes out of it and we lose a lot of the nutrients which is a why the raw food, where the principle comes from. So you can combine the two, I really believe that. I think there is a lot of amazing stuff within the Ayurvedic system. From what I’ve observed just even with my own body, I used to get bloated all the time and all those things. So when I applied kind of both systems together, it works for me really well and just understanding that in winter you’re adding some ginger and you are adding some black pepper, cumin and spices like that and heating the body up and helping the cold and stuff like that. I think there’s a nice cross over there. I can see that it does look and it does appear that they are polar opposites but I think when you sort of merge and look at hang on, that’s that principle and that’s that principle, actually there are ways to sort of address both. Caryn Hartglass: Now, you have a lot of different recipes at the beginning of the book; smoothies and juices. I’m looking at one here right now that I really like a lot which is the creamsicle smoothie because it brings me back to when I was young and we had the ice cream man come along and we had these creamsicle pops with ice cream and orange. This is so much better and you get the same luscious combination of vanilla and orange and creamy and yummy. Rowena Jayne: Yes exactly, without all the detrimental inflammation. Caryn Hartglass: Yes, no inflammation please. It’s just good nutrients. Rowena Jayne: That’s the good fats in there with the cashew milk for the brain health and for the skin and the nails and the hair. It’s just profound isn’t it, that we want to create these processed foods just to get the flavors. It’s crazy. You can get the flavors so much better when you just use real food. It flabbergasts me. Caryn Hartglass: So you make some really interesting things in here like banana coconut pancakes. Caryn Hartglass: How complicated is this? Rowena Jayne: You know, a lot of raw food looks complicated because raw food tends to use a lot of ingredients so it’s really daunting when you first look at it but it’s easy if these things are staples in your pantry. It’s actually easy because you’re just using a blender and you’re just putting it all in the blender and then mixing it up and then literally using a spatula to put it on a dehydrator tray and then putting it in the dehydrator. It’s actually just as simple as making pancakes any other way. You don’t have to sit there when you’re making pancakes on the pan, you have to sit there and actually do the batter and turn it over and do the batter and turn it over. It can take you up to an hour to make a batch where you just literally blend it up, put it in the dehydrator tray, put it in there, turn on the timer and you come back and check it whatever, 10 hours later and it’s done for you. It’s actually, I find it, easier for you. Caryn Hartglass: So you could plan a breakfast. It’s all about planning because if you fail a plan you fail. It’s easy to put together but it does take time to dehydrate. Rowena Jayne: It does, that is the time consuming thing but if you have a 5 tray or a 9 tray dehydrator, what I did was make batches at once. So I come in a make a whole bunch, sometimes I double the mixture. The great thing is that they freeze really well or even just stay in the fridge and then you can add the fresh ingredients like the fruit or whatever you’re going to have it with when you actually want to have it. It’s easy. Just pull it out, bang, put on your fruit and there you go, you’re ready to go. Again it goes back to that planning. Caryn Hartglass: Right, now one more recipe before we go because I can’t believe we’re almost done here is I’m a big fan of, and I never pronounce it right, but it’s the Vietnamese soup. Rowena Jayne: Oh the pho. Caryn Hartglass: Pho, which I pronounce “pho” but I’ve learned it’s pronounced “fuh”. Rowena Jayne: Oh yes, I know. I just say pho. I’m the Aussie and I say it as an Aussie. Caryn Hartglass: Yes, I like saying pho but you have a very lovely pho that you can serve here warm or cold and really, really good with coconut, lemon grass, miso paste and chili flakes. Yum. Rowena Jayne: Yes, it’s pretty yummy. It’s good. I find I sometimes use that as a base and then put other things in there as well. But yes, it’s so easy. Again, it’s just all in the blender. It was actually inspired by Matthew Kenney when I studied and did my raw food chef training with him. We had a very complicated pho that we had to make. We had to dehydrate the broth. It was teaching us about making broths and about how to really deepen flavors of stuff so it was great. But I really loved it so much that I thought this was going to take too long for me, I just want to be able to put it in the blender and that just inspired me to play around with other ingredients and throw other things in and then just make it in a blender and it turned out, so yes! Caryn Hartglass: Well Rowena, I can’t believe we’re out of time. I just want to say that I’m loving your book, The Joy of Real Food. If anybody just needs more convincing about the power of these healthy foods, you just need to look at the cover of this book. You are beautiful. You have long healthy, gorgeous hair and it only comes from good nutrition. Rowena Jayne: Yes it does because it was pretty horrible before that! Caryn Hartglass: Anyway, thank you for getting up early in the morning to talk with us here on It’s All About Food. Rowena Jayne: Thank you Caryn. Caryn Hartglass: Okay. I hope maybe we can connect maybe somewhere on this planet somewhere. Rowena Jayne: For sure, for sure. I hope next year I will be coming to the States next year anyway so hopefully I can catch up with you. Caryn Hartglass: Excellent, let me know. Okay everybody, thanks for joining us on It’s All About Food. I’m Caryn Hartglass and remember, have a very delicious week.